Silvered bronze antoninianus, 21mm, 4.01gm, issued AD 283. Antioch mint. 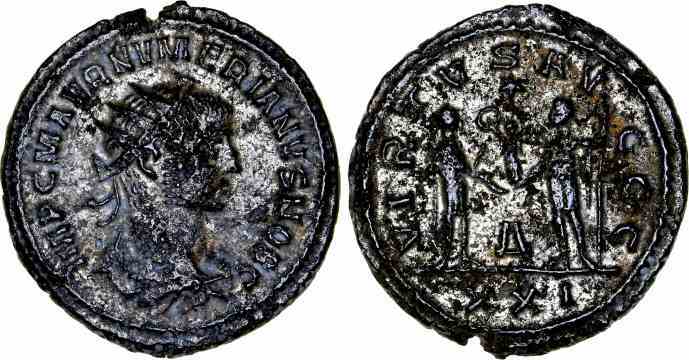 Obv: IMP C M AVR NVMERIANVS NOB C, Radiate, draped and cuirassed bust facing right. Rev: VIRTVS AVGGG (XXI in ex. ), Jupiter on right handing Victory on globe to Emperor, star above, Δ below. References: Sear 12225, RIC 378.